National Marine Sanctuaries protect ocean and Great Lakes areas of national significance. 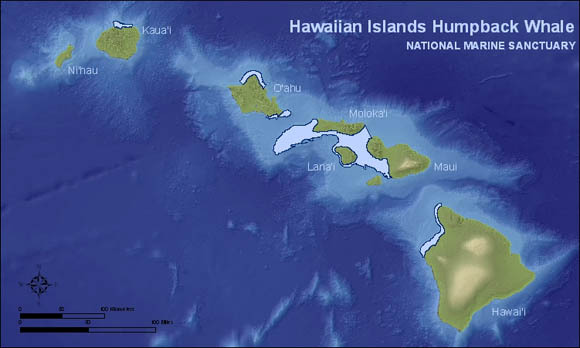 The Hawaiian Islands Humpback Whale National Marine Sanctuary was created by Congress in 1992 to protect humpback whales (Megaptera novaeangliae) and their habitat in Hawai‘i. The Sanctuary, which lies within the shallow (less than 600 feet), warm waters surrounding the main Hawaiian Islands, constitutes one of the world’s most important humpback whale habitats. The Sanctuary is managed jointly by the National Oceanic and Atmospheric Administration (NOAA) Office of Marine Sanctuaries and the State of Hawai‘i Department of Land and Natural Resources by way of a Compact Agreement and Memorandum of Agreement. Outreach and education programs and projects are conducted to foster awareness of Sanctuary resources and to promote ocean stewardship among Hawai‘i’s residents and visitors. The Sanctuary also provides training focused on boater safety and workshops on how to interact and view marine animals safely and legally. The Sanctuary conducts and supports humpback whale research that aims to increase scientific knowledge about the North Pacific humpback whale population and its habitat. Research efforts include photo identification, population, birth and mortality rates, and whale behavior. The Hawaiian Islands Disentanglement Network is a community-based network that was formed in 2002 in an attempt to free endangered humpback whales and other marine animals from life threatening entanglements and at the same time gather valuable information that will help mitigate the issue of marine debris and future entanglements. To date, this team has freed 16 whales from life-threatening entanglements and removed more than 6700 ft of gear. Watch a short video by NOAA about what it takes to disentangle a whale. To learn more, please visit our partner site.